In football, teams can win and lose by the leadership of quarterbacks, who work directly with individual contributors to motivate, coordinate, and drive results. 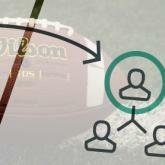 In the office, your team quarterbacks are your managers, and they deserve just as much careful selection as any first-round draft pick. That’s because a good manager can motivate a team to realize its full potential, while a poor manager can discourage, deflate, and ultimately drive away high performers. You’ve probably heard it before: bad management is the number one reason people leave their jobs. Unfortunately, research from Gallup finds that only about 1 in 10 people possess the talent to manage. So for recruiters, it all comes down to knowing how to spot those with the gift. You know that recruiting people who share in your company’s vision and values is key. But recruiting for cultural fit is arguably two-fold when filling a position at the managerial level. Since managerial work is all about people-to-people interactions—giving direction, feedback, and constructive criticism—a manager really needs to understand how the people on his or her team operate (including what they value and why they’re there). A manager’s cultural fit directly impacts an entire team. Consider, too, that in the future a manager will have a role in bringing others onboard as a hiring manager, and they’ll likely hire in their own image. If they’re not a strong cultural fit, that mismatch will continue to impact the company. Putting cultural fit at the forefront of your recruitment marketing materials and screening process decreases the likelihood you’ll invest in candidates that don’t work out. Give a description of your company’s culture some prime real estate on the job descriptions you post to job boards, social sites, and your career portal, and ensure questions relevant to cultural fit are a staple of your phone interviews. To increase your chances of finding someone that’s going to mesh well with your teams, you can also leverage your employee referral program. There’s a good chance your current employees know likeminded people, so why not tap into their networks? Coaches want quarterbacks that can lead a team over the course of many years, not just one championship season. Your company’s business strategy probably depends on the same from its managers. That’s why the long view should be taken into account at the very start of the recruiting process. It’s easy to think of the qualities you need in a manager today, but what could be asked of them in two, three, or five years down the road as the company evolves? This is an opportunity for recruiters and hiring managers to align ahead of time, to ensure that the job description, phone interviews, and resume review process take “down-the-road” responsibilities into consideration. Finding your next star quarterback doesn’t have to mean scouting external sources. Your company may already be ripe with employees with the right managerial skills. Those currently serving as leaders may be looking for a chance to switch departments, or individual contributors may be waiting for a chance to exercise the leadership acumen they’ve always possessed, but never had the chance to showcase. Plus, hiring from within means onboarding is expedited, company processes are known, and relationships with coworkers are established. However, when pursuing internal recruiting avenues, be cautious of assuming that a strong individual contributor will make a strong manager. These roles require entirely different skill sets, even though continuing to promote top performers may seem like a natural progression. Unlike an individual contributor, a manager’s day-to-day is less about production and more about navigating the complexities of working with others. Managers need to be “people” people and deal with unexpected challenges successfully. That’s why focusing on situational interview questions (the “what would you do if…” questions) can be a particularly helpful way for recruiters and hiring managers to determine if a candidate is a good fit. Ask candidates to describe how they would respond to situations they’re likely to encounter on the job, or perhaps situations your department has struggled with in the past. Situational questions should help shape your understanding of the candidate’s communication style, decision-making skills, and pragmatism. In addition to hypotheticals specific to your company, ask the candidate for examples of how they’ve dealt with situations in previous positions. A strong candidate should have ample experience to pull from. For more on finding the right hire, you can check out our other article, “The Top 5 Mistakes Hiring Managers Make".